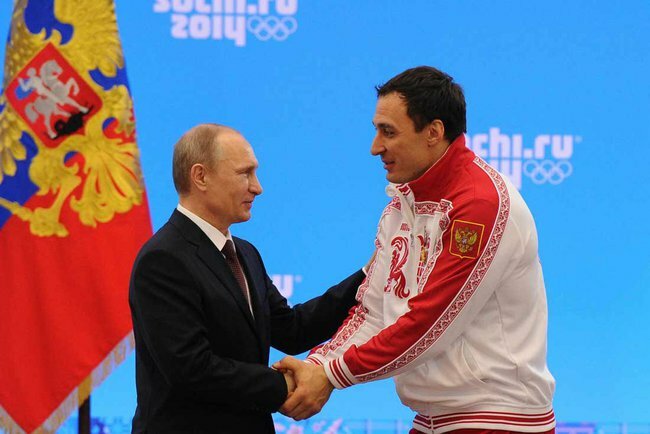 Alexey Voevoda is a double gold medalist in the two and four man Bobsleigh events at the 2014 Winter Olympic Games in Sochi, as well as a multiple World Champion in the sport of Arm Wrestling. Saida Panesh (SP): You have a beautiful surname. Please tell me about your family tree. Alexey Voevoda (AV): My surname is formed from the title ‘Voevode’ (Palatinus). The word appeared in the tenth century and it was also often mentioned in chronicles. In old times they called him ‘Commander of Prince’s Armed Forces’ or ‘Leader of Irregulars’. The Voevode ran Ancient Russian cities. He was Governor of the Province. The title existed both in Medieval Czech Republic, in Bosnia, Bulgaria, Hungary, Croatia, Serbia, Moldova, Walachia and Transylvania. The commanders of rebels during the Ottoman dominion in Macedonia were also called ‘Voevodas’. Today in Poland ‘Voevode’ is a position of the Head of Voevodaship, corresponding to the status of Governor. The first surname mentioning it belongs to the fifteenth century. In historical documents from 1495 in Novgorod the landowners are recorded: Voevodin Alexey, Mordvin and Sich. At the time they had the surname ‘Voevoda’, that pointed to activity and social status of my direct ancestor. The surname was never given by chance. There are leaders among my close relatives. My father was the First Deputy Chairman of Executive Committee in Sochi. My grandfather was much respected also, an authoritative person. People from nearby villages visited him specially to seek his advice. SP: They say that your grandfather was a giant. Tell us about it. AV: The name of my maternal grandfather was Pavlo. He was well built, possessed both great manual power and mind, and sensibly operated with both. A strong, quiet and hardworking person, he could bend coins with his bare hands. He had one hard corn on a palm hiding his lifeline. So, from a position of chiromancy my grandfather had no life at all, but he lived his life with dignity. He was a merry fellow, and had a developed mind. My grandfather was a hero. During the Second World War he was wounded, and as a disabled person received ‘Zaporozhets‘ (a car) from the State as a present. Nobody taught him but he looked at the scheme and demounted and assembled the engine. When asked who my idol is, I usually answer that the only person who arouses my absolute pride is my grandfather. I am very proud of him. SP: Is genetics important for the athlete? AV: The geneticist in sport has no key value, as the mind mostly has. Will power leads to heights of greatness of achievements in any field. Mentally unbalanced people without will power, but with good genetics achieve nothing. The force of intention is important for achievement of a purpose. One can wish for something, and one can have an intention. It is well described in a book by Vadim Zeland ‘Transferring of Reality’. I always have an intention. I know what is necessary to do in order to achieve the objective. Some people want to achieve results at once and are complaining about their life, without understanding why this result doesn’t happen to them. Intention is an alive essence; it allows achieving what is on its vector. SP: How did you get into to Arm-Wrestling? AV: Each person always has an illusion of pseudo-choice. My father often arm wrestled with me. I took this ‘entertainmen’ to school where I easily won over everyone. At the end of 1999 in the Settlement of Dagomys, in Sochi, there took place an Arm-Wrestling Open City Tournament ‘The Iron Hand of Sochi’. I was 19 years old at that time. My friends dragged me to the competition and I won, beating Cote Razmadze, who was professional, the Champion of Europe. The athlete was surprised himself. Amateur won over professional. He suggested being my coach but disappeared. I decided then that this person would not appear in my life any more. But one day my school friend Vitaly Bitsadze and I went along to the Sochi Trade Gallery, and I wanted to take the definite road – it was in mud among stalls. The matter is that I do many things intuitively correctly. My friend dissuades me, but I pull him that way, so we go as I want, and destiny takes us to a group of people and my future coach Cote Razmadze is there. It appeared that he looked for me too. We began talking and I showed him where I coach myself and we began training. In two months we went to the Championship of Arm-Wrestling that took place in Orel, where I came second in the 100 kg weight category. It was my first prize-winning place. The next day I celebrated my birthday. I was ill with a temperature and on a train… I was 20 that time. I was born on 9th of May, Victory Day. Therefore I don’t know who chose who. I suppose Sport chose me. SP: Tell me about your mentors. AV: I had two coaches, Cote Razmadze and Victor Isaev. These people opened a gate in professional sport for me. They corrected my technique and were 100% partners in the research under the name “professional sport”, where the method is sport, and the object is my own body. SP: You were born in 1980, year of the Olympic Games in Moscow, on 9th of May, the Victory Day. Do you have the philosophy of a winner? AV: I have the philosophy of a leader. I shall never occupy myself with an activity in which it is impossible to achieve the maximum result. But I am sure that it is possible to be the best in any kind of activity. If someone could, I shall be able. SP: Are you planning your return to Arm-Wrestling? AV: I haven’t made a final decision yet. But, as Aleksandr Karelin once noted “wrestlers can never be ex”. I know exactly that whether I am back to professional sport or not, Arm Wrestling will forever stay in my heart. I am only 34 years old and feel my potential. Life is wonderful and multifarious. Now all the horizons are open for me, so I am waiting for pleasant surprises. I am open to new, interesting projects and cooperations. 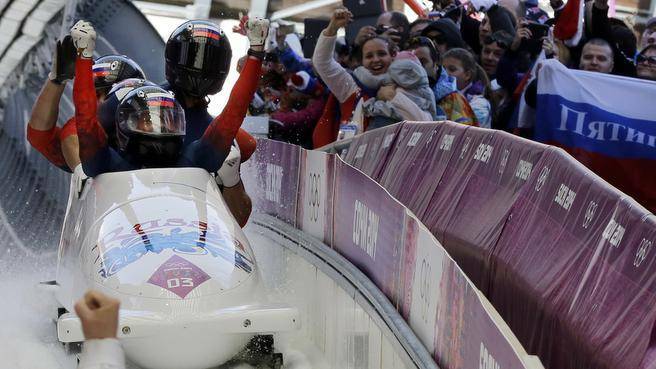 SP: Why is “the Bobsleigh a command sport where everyone is for himself”? AV: There is very fierce competition in a national team. That is why the team is often invisibile. But after my truce with Alexander Zubkov I ‘exhaled’ because I feel myself to be the necessary element in a difficult chain called ‘Bobsleigh’. In Alexander Zubkov’s team – one for all and all for one. SP: Do the skills of an Arm-Wrestler help in Bobsleigh? AV: Sure, together with Victor Isaev and Cote Razmadze we developed a unique strategy which I implemented in bobsleigh. It is a technique of working with corners; with vectors. It allows us to use movement skills and transfer them to the training process. SP: Should the modern Bobsleigher know Physics? AV: Yes. Physicist, Biomechanics, Physiology and Biochemistry. It is necessary to understand the oxidation of the body, further lye extraction, how the proteolysis comes and what is absorbed by human organisms. If there is no basic knowledge, he will consume junk food or dietary supplements, which shouldn’t be used. Each person must be educated. Women are now often more educated than men. They study more diligently and work more effectively. Modern men should have not only the Cult of Body, but also the Cult of Mind. SP: How did your studies at school go? AV: I love self education. I love technical literature, Esotericism, Psychology and Parapsychology. I consider these sciences to be the basics. I agree with the phrase: “It isn’t necessary to expand consciousness, stop to limit it.” For me it is interesting both what we eat and what we think of ourselves. SP: Is Vegetarianism a philosophy? AV: Initially Vegetarianism had no relation to Philosophy; it is related to the Physiology of Digestion and Biochemistry. Having studied digestion processes, I came to a conclusion: we are not carnivorous, not herbivorous; we are frugivorous. I support the doctrine of academician Alexander Ugolev. He published ‘The Theory of Adequate Food and Nutritional Science’ in 1991. Before this book I thought that using certain food, it was possible to have minerals, amino acids, hormones, vitamins and so forth, but now I simply have my micro flora that gives all this to me. SP: But how can a person who doesn’t eat meat be engaged in sport? AV: Look at me. I don’t eat meat for four years. In the Summer I became a rawfoodist. My thermoregulation became better. I am bathing all year round in mountain rivers, in which water is 3.5 degrees. I never get sick. SP: Aren’t you tired of attention? Is glory probation? AV: I first became a champion at 19 years, now I am 34. I was waiting for something to change in me, but I am the same. The attitude of society changed! People start feeling not “that fellow Lesha from the yard” but the world champion in me. When people began talking about me, I was suddenly remembered by those who weren’t interested in me before my victories. But it can also happen that I pass by someone and I don’t remember the person because earlier didn’t communicate with him much and he says: “Voevoda put on airs, he doesn’t greet”. In general, of course, glory and money can change people but if the person is strong, nothing will break him. I can be tired not from attention but from its absence. It is pleasant for me when it is possible to represent not a false truth to masses. I am glad if someone reads my interview and will reflect whether he lives or eats correctly. SP: Then what is glory for you? AV: A bright flash. When this flash is directed on you, you should pass it through your heart, feel rejoice and live your life. SP: Bobsleigh is an injury causing sport. Is it possible to lower the risk of injuries? AV: Not to be engaged in Bobsleigh at all, the elastic joints, ligaments, bones and bulletproof skin can help (laughs). Actually, elastic joints and ligaments can be real. When I stopped eating meat my joints became more elastic. Two years ago at competitions I was almost thrown out from a Bob. I hit a shoulder, could have broken it but, as I am insured by my lifestyle and nutrition, nothing bad happened. But risk in a professional sport is the norm. SP: Where are you training? AV: I am living and training in Sochi. I love my city, and I am proud that today it is a beautiful world-class resort with developed infrastructure. Before the Olympic Games there was stagnation of the real estate market. Now there is a shift towards sales that adds bright prospects. I think that sanctions from Europe and America are positive for Russia, because now the Russians will stay in our beautiful city with more pleasure. SP: Are you interested in Politics? AV: Yes. I am a person with an active life position. I took part in elections both in State and Regional Dumas, but I haven’t been elected yet. My motivation is my desire to help people. I will try more. SP: Do you know any foreign languages? AV: I know English, but there is no “more tasty” language for me than Russian. It has a lot of rich, informational and aesthetical sentences and phrases. It is more convenient to describe the emotions, feeling in Russian, not in another language. In ancient Slavic civilization the letters AZ, Buki Vedi – were used as multidimensional images. They are messages from our ancestors. By the way, Old Slavic and Sanskrit belong to one Indo-European language family. I love Slavic languages very much. All of them are much alike. The Ukrainian language – to Polish, the Belarusian – to Russian and Slovenian. If I practice, in two months I will be able to communicate freely in any Slavic language. And it is a pity for me that today, Ukrainian and Belarusian languages have became foreign. SP: Are the relations between Russia and Ukraine a painful subject for you? AV: Sure. My mom is Ukrainian and my father is Russian. There are a lot of my relatives in Ukraine. SP: Do you have a favourite Russian dish? AV: I love Russian Lenten Borsch with a nettle – it is very tasty. But in general I prefer Raw foodism. It is possible to breathe with a full breast only this way. I tried a Raw Mono Foodism (to eat vegetables and fruits separately), I wish to change to it completely. An effect is pleasant for me. My body is light and you flit as a butterfly. According to Prano eating people in general can absorb energy from the Sun. Prano eating is a way of energy transition, passing digestion, but unfortunately our spiritual level of development doesn’t allow this. SP: What kind of yoga are you practicing? AV: Intuitive dynamic yoga. Once a 90 year old man advised me to practice yoga in the wild. I get huge pleasure when I am near the murmuring small river where the birds are singing, in mountains, in the woods where there are no buildings which prevent unification with Supreme. I am a highlander, I love the Caucasian Mountains. For me Altai, the Caucasus are the spiritual centers of the world. I feel comfortable in a wood. In the old days we had Vedic civilization, the people ‘vedali’ (In Russian language – “knew”). I believe both in cults of family and kin. SP: What traits should the potential wife of Alexey Voevoda possess? AV: She has to be a companion. I appreciate fidelity, devotion, purity and chastity in women. The sexiest woman for me is one that has a warm look. Each man is attracted by purity. Flexibility is an important sacral quality of women. It is certain that if you are man you must be a man, if you are woman you must be a lady. SP: Do you have any followers or pupils? AV: Yes. I share my knowledge with pleasure. SP: Does your intuition help in sport? AV: I became a good Arm-Wrestler because I follow my intuitive voice. When I began sparring and I take my rival by the hand, I feel his potential and understand how he will fight. I can’t tell my fortunes, but I can tell the fortunes of other people. I know whether my rival will be a champion. If “no” – I shall win, if “yes” – I shall lose. I love to fight, the oriental martial arts – the conditions of changed consciousness are involved in them (for example, through entry into a fighting trance, the achievement of emotional impassivity, the aspiration to self-sacrifice etc.) and also the physical activity of the body. Many centuries ago using sacral knowledge people recuperated organs whose function was broken; they slowed down the aging process. Today in the North of India there is a tribe practicing different spiritual techniques. They have a poor diet. The people bake flatbread on hot stones, eat fruit and dried fruits and drink clear water. Their food is healthy therefore the fermental system stimulates the maximum release of energy necessary for human life. Average life expectancy in this tribe is 120 years. Unfortunately today, super knowledge and super abilities of people are lost. SP: How do you see your future? AV: Long before I started in sport, I had a set of global objectives. I used sport as a springboard. It was successful. I jumped and where I shall land – it depends on my ability to plan. I wish to create a network of fight clubs which would bring up true, efficient men for Russia. They must be harmonious developed personalities, athletes accepting culture and spirituality as a norm. There will be training simulators, rings, tatami, the Russian steam room and restaurants of healthy food in these fight clubs. So it will be possible to have vegetarianism there. The point is, being vegetarian is tasty and it is good for your health. Life is a global experiment. I am not afraid to experiment. Are you? Saida R. Panesh was born in the South of Russia, North Caucasus, Republic Adyghea. She graduated from Adygh State University (Mykop), Department of Foreign Languages then took a Postgraduate study and defended the Candidate’s Dissertation in Linguistics at Kuban State University (Krasnodar). 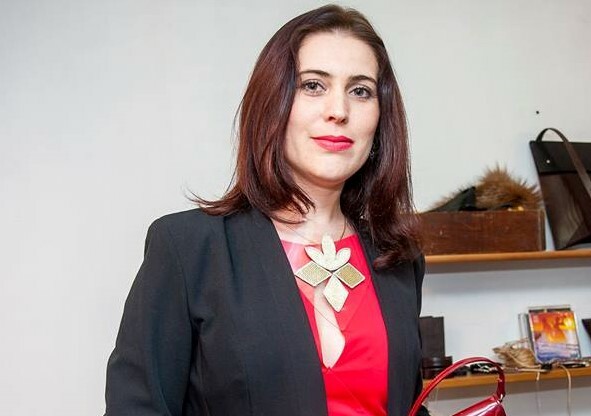 She is now an Associate Professor at Department of Romanic and Germanic Philology at Kuban State University. 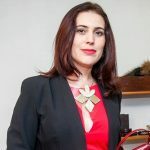 For the past fifteen years Saida has also worked as a journalist for numerous publications, author of works on a number of subjects including Business, Economy, Culture, Sports and Science.